In Part 2 of the IELTS Speaking test, the examiner will give you a topic card and ask you to talk about it for 1-2 minutes. 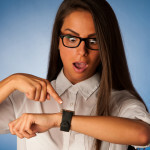 In this model answer, the candidate talks about a situation when she was late. How can I start talking about a topic? I received an email from Anish in India. Anish wants to know how to start talking about a topic (in IELTS Speaking Test Part 2). In this post, I'm going to give you a few tips. In Part 2 of the IELTS Speaking test, you are asked to talk about a topic for 1-2 minutes. If you manage to speak for 2 minutes, the examiner will ask you to stop. However, if you speak for less than 2 minutes, you have to stop yourself. Many candidates talk for about one minute and then try to think of something more to say and then become nervous, sit silently or make mistakes. Don't make this mistake! In this post, I will give you a tip on how to finish your answer. In this post I'm going to share with you a video of a 'Band 6.5' candidate talking about a well-known person in Part 2 of the IELTS Speaking test. Below the video I've included the examiner's comments. If you are aiming for Band 7 or higher, this should give you an idea of what the examiners are looking for. In today's tip, we are going to watch a video of the IELTS Speaking test. The video shows the complete test -- Part 1, Part 2 and Part 3. If you have not taken the test before, this video will give you a clear idea of the type of questions and tasks that you will get. This candidate's score was probably around 5-5.5, which is a little lower than most people's target band. Below the video, I will explain how the candidate could improve his score. 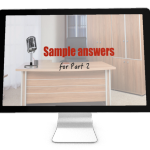 In today's tip we are going to watch a video of a sample answer for Part 2 the Speaking test. If you haven't taken the Speaking test before, this video will give you a clear idea of what you have to do in Part 2.